Within past Sunday free GUNNER24 Newsletter "Gold Signals a Top", I have sent my opinion on the current situation of the gold, as well as my medium-term expectations for the development of the gold. Please click here on link to re-fresh this very, important mid-term view in which we should in trust until proven otherwise! 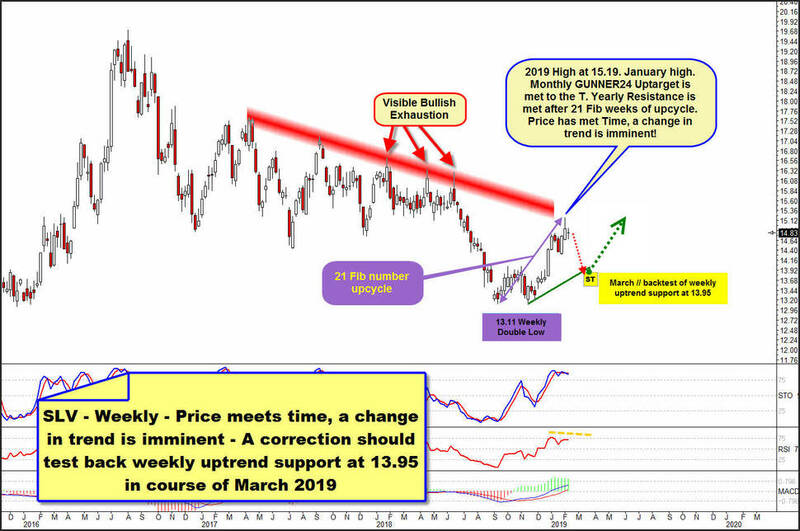 But actually, silver is the main issue or reason why the Gold-Silver Complex should now have topped on intermediate base and as a consequence could have started a perhaps up to 2 months lasting downtrend or 8 to 12 weeks running correction cycle. ... then it was a high probability that the trend that started at 2018 Double Low Pattern has to work off upwards projection according the time and the price factor cause this is very attracting upmagnet resistance on monthly but also on yearly base. 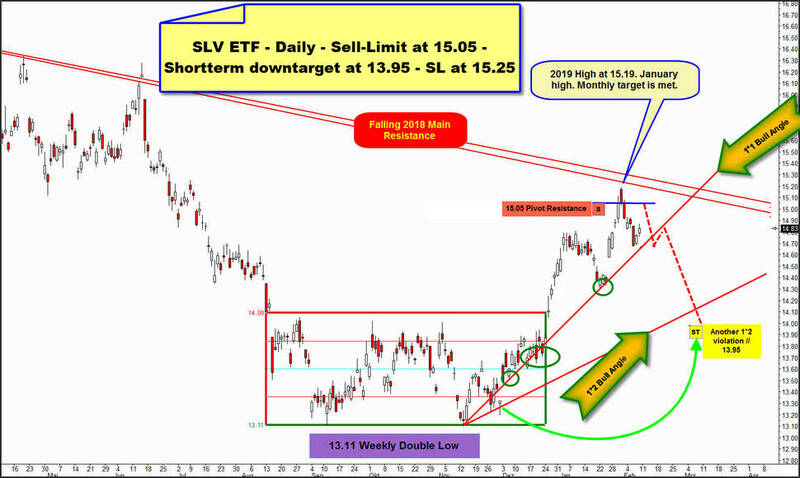 Towards the end of 2018 the SLV ETF told us that a 15.30$-15.15$ is almost inevitable for the upcycle that began after the bullish resolution of the 2018 Double Low pattern cause price jumped above a Sideways-Box which could maintained for 91 trading days and this was important combined price/time signal for a sustainable change in trend that usually should have tested above red highlighted yearly countertrend resistance, at same time strongest nearest important upmagnet. With a very high odd the printed 15.19$-January 2019 High is the next important cycle peak cause penultimate week candle has delivered long upper wick starting at most strongest existing falling resistance area. This is sign of bull exhaustion finally kicking in at 15.19$ 2019 High. Exactly this same signal could already be recorded three times at the 3 important lower week highs of the year 2018, I`ve highlighted with the red arrows. Unfortunately for the bulls we are additionally able to count a 21 Fib number upleg on weekly base into current 2019 High, if we start the weekly cycle count at the first 13.11$ pillar of the Weekly Double Low. Most strongest existing falling SLV bear market resistance is worked off after an 21-week upleg. This is 7th test of that Big Resistance in course of past 2 years. Odds are that resistance brakes again for weeks, and even months! 21 Fib number is very important possible turn signal and this means: "Price meets time, a change in trend is imminent" W.D. Gann. And well, an expected quite normal correction cycle starting at this year high usually has to test back the rising weekly uptrend line that is dark-green highlighted above and near or close to the 14$ Gann number downmagnet for March 2019. 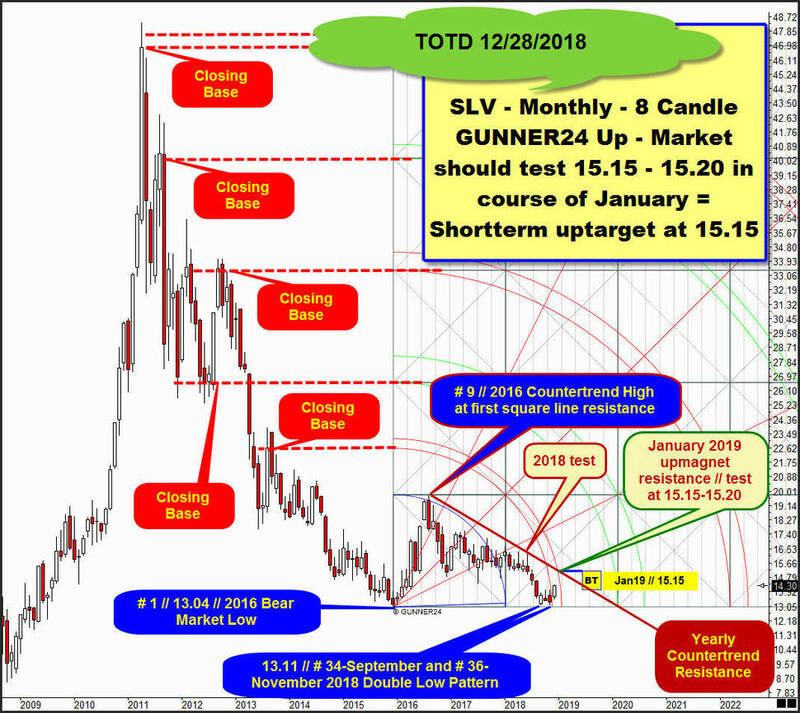 We recognize an about 30% probability that silver just now, either at January, and/or February 2019 highs, prints it`s FINAL HIGH of this trading year. Classic SLV in the daily chart is now somewhat bearish although the above highlighted falling 2018 Main Resistance wasn`t reached or worked off precisely from below, as 2019 Top worked off MAJOR 2019 target resistance area that resides 15.15$ up to perhaps even a 15.30$. After year high market began a daily downtrend, making lower highs and lower lows and lower closings. Downtrend is at day No. 8. Accordingly bounces should be now be sold. A bounce in course of next trading week could test back the 15.05$. This is very interesting price. There opened the candle of the day on which the year's high was made. 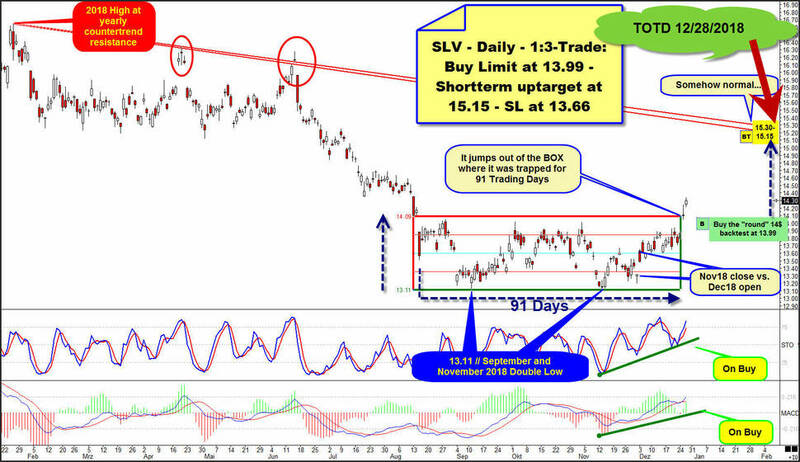 The day before, SLV closed at 15.05$. The day after the achieved 2019 High market opened exactly at 15.05$. The 15.05$ are confirmed important Pivot for SLV!! And of course that's why 15.05$ now has morphed to a very important future horizontal resistance, that can be tested back soon! ==> 1:3-Sell-Limit order at 15.05$! ==> The daily and weekly uptrend has reached partially heavy overbought readings, and market has started to react to the falling Big, Big resistance and that`s why I expect that likely rolled over daily time frame needs another test of confirmed 1*1 Bull Angle support that springs from second made 13.11$ pillar of the Weekly Double Low pattern. The 1*1 Angle became confirmed daily main support after it was tested successfully at all the green ovals and thus is now an obvious = very attractive downtrend support magnet for the started downtrend. 1*1 Bull Angle might be tested back within 2 to 4 trading days AFTER advised sell-short level was hit. And IF SLV has now started a down cycle or correction cycle on weekly base the daily 1*1 Bull Angle will be finally and decisively broken to the downside within next 10 trading days or so and as a consequence market should aim next important daily Gann Angle below 1*1 Angle which is the 1*2 Bull Angle within a perhaps 8 to 12 weeks running correction. ==> For March the confirmed weekly uptrend support and the confirmed daily 1*2 Bull Angle form price/time objective shy below 14$. ==> Thus, shortterm downtarget for SLV is 13.95$/March 2019! Please place the Stop-Loss (SL) for a 15.05$-Sell-Short position at 15.25$. This is 6 cent above current 2019 High! Be a part of our exclusive sworn GUNNER24 Trader Community – now... I try to make you rich! The hottest trades worldwide! Everyday one fresh trading idea! Click the button below and order the GUNNER24 Trade of the Day - $49.90 US a month. For your investigations of the published past GUNNER24 Newsletters click here. Complete GUNNER24 Trading and Forecasting Course - learn to use a forecasting technique that produces 70% winner trades. If you have forgotten your membership password, click here, and we will send it to you via e-mail. If you no longer wish to receive the forecasts please unsubscribe. To ensure delivery of our forecasts to your inbox, please add gunner24-forecasts@gunner24.com to your e-mail address book or safe senders list. Charts courtesy of Ensign Software, Inc. This e-mail contain confidential and privileged information. If you are not the intended recipient or have received this e-mail in error please notify the sender immediately and destroy this e-mail. GUNNER24.com provides information and education for viewers to use or not when evaluating and making their trading decisions and nothing contained herein or in any subsequent e-mail or correspondence or discussion can or should be construed as trading advice or as a recommendation to buy or sell any particular index, currency, commodity or share or to take a position in any market. GUNNER24 is not an investment advisory service, nor a registered investment advisor or broker/dealer. Any decision taken by a viewer or a member on whether to trade or invest or not in any particular case is the subscriber's or member`s own decision and entirely at his or her own risk and whether made with or without the assistance of a financial adviser. GUNNER24 and its representatives accept no responsibility for any such decisions made. It is strongly recommended that a position in the market is always accompanied by a stop loss. Trading in indices, currencies, commodities and shares involves risk; money can be both lost and made. Trading shares, indices, currencies and commodities can be done in a variety of ways, such as for example (but not limited to), buying and selling futures and options in underlying equities, indices, spread or binary betting, direct purchase or CFD's. How you use the information provided by GUNNER24 is purely and exclusively at your own risk. Copyright © 2019 GUNNER24. All Rights Reserved.